The term 'Free-Range' is widely used to market and sell eggs. But the term itself has been the subject of a whole heap of marketing. Hatcheries are factories where chickens’ eggs are intensively incubated and hatched, and, regardless of where they end up, the lives of all chickens begin here. After hatching, male and female chicks are separated as only the female chicks will grow up to lay eggs. Because they cannot lay eggs, male chicks are of no subsequent use to the egg industry. They are killed, therefore, at about one day old. The most common methods of slaughter are gassing, suffocating, crushing, or grinding alive. Male chicks inevitably make up a significant number of all hatched eggs, and we can only guesstimate how many hundred million are killed this way (every year) as no one deems their short lives important enough to record. They are not included in the over 945 million slaughtered each year in the UK (as recorded by DEFRA). The lives of all chickens, free-range or not, begin with violence. 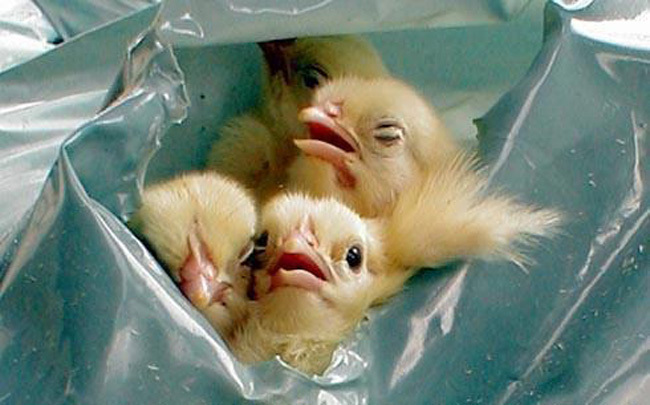 Male chicks in garbage bag, about to be suffocated to death. Image courtesy of Animal Equality. Egg production peaks when a hen is around one to two years of age. When a hen is no longer productive enough for a farm’s needs she is usually killed for low-grade meat, far earlier than her natural life span of around seven or eight years*. Free-range hens are still regarded as ‘egg producing machines’, and are slaughtered as soon as they cease to be profitable. *This is an acknowledged average lifespan for a chicken. Chickens are so badly treated that even rescued chickens tend to die young, due to illness and disease contracted in their early months and years on farms. It has been reported that some chickens, when allowed to live and grow naturally have lived up to 13 years of age. These barns have a stocking density of up to four hens per square metre. When you consider that a caged hen has the equivalent of one standard iPad’s worth of space, the extra pennies you spend on buying free-range eggs only guarantees a few, extra square centimetres for the chicken who made them. The reality for free-range hens is very different to what the adverts tell us. They are still very closely confined, with little room to peck and scratch at the ground. When most chickens live in abject misery, their living standards only need to be a made a little bit better in order to be given a new name. And the name in this instance, is ‘free-range’. Free-range chickens. Image by Jo-Anne McArthur. Pop-holes are the exits provided in barns to allow free-range hens to get outside. Many barns don’t have enough, and the exits are often blocked by dominant hens asserting the pecking order. On average, less than 10 per cent of free-range chickens will be outside at any given time. What’s more, many never go outside at all. Overcrowding in the free-range system leads to the same problems of aggression and feather-pecking that we see in cage and barn systems of egg production. This is caused by frustration and stress as the chickens compete for space. Whether a ‘free-range’ hen or a caged bird, the slaughter process is the same for all the animals. In the UK, chickens are either killed using a neck cutter (the most popular method) or gassed. *Neck cutting: chickens are hung upside down by their legs on metal shackles on a moving conveyor belt, stunned in a water bath (which frequently fails), and have their throats slit (while conscious if the stunning has failed). It usually takes several minutes for the chickens to bleed out and die. To find out more about hens, and what they experience during their short lives, please click here.